Anyway, here's a photo of the stickers that I received. First thing that caught my attention was the size of the stickers. The reason I never used full nail stickers before this is because I have wide nail beds, and the stickers never cover the full width of my nails. So I was a bit skeptical about how those would be. I decided to use the following one, because it was around Easter when I finally decided on which one to wear, and you can never go wrong with an elegant bling-bling for going to church. As soon as I opened the packaging, a strong chemical glue smell hit my nose like when the Hulk went crazy on Loki in The Avengers movie. It's such an unpleasant smell, I think I felt dizzy for a few seconds because of it. But that didn't stop me from putting the stickers on. I've been in worse situations than a glue smell in my life, so this was a piece of cake to endure. Once on, though, the smell subsided a bit, and after a few minutes it was gone. The glue on the sticker is pretty strong. I wasn't expecting that, to be honest. It adhered to my nails very well. I didn't have any base coat on, even though you could use base coat if you want to. Once you place the sticker on, it's difficult to pull it off to correct the placement. Just keep that in mind. After I was done, I added a layer of top coat according to the instructions on the packaging. Like I mentioned in the beginning, my nail beds are wide. So I wasn't sure how those stickers will fit. As you can see from the photos, they fit pretty good on four of my fingers. As for the thumb, well, even the biggest sticker was a bit too small. I must admit, while still in the packaging, this design was my least favorite of all the stickers that I got. Which is why I decided to sacrifice it first, so in case they're too small, or I mess up the application, I wouldn't be too disappointed for ruining them. But, to my surprise, once I got them on my nails, I fell in love!! They looked amazing!! They made my hands look so delicate and -even though it's a lot of rhinestones- also sophisticated! The stickers held up really well for about 2 weeks. And only then I noticed a bit of wear at the tips. I must add that I hand-wash dishes and I don't use gloves. I also don't wear gloves when I'm cleaning the apartment. So I guess this particular design went through a rough two-week endurance test. And it passed with flying colors. Not bad for a two-week wear, right? As for the removal, the instructions say to dip your hands into warm water and using an cuticle pusher (or an orange stick) start removing the stickers off your nails. I was an idiot who didn't feel like doing that, so I just grabbed the cuticle pusher and started peeling off the stickers. They were glued to my nails like there's no tomorrow! Even after two weeks! They left a bit (ok, a lot) of glue residue after removal, which I cleaned up with nail polish remover. My nails were still a bit sticky after that, but once I washed them with warm water and soap, all stickiness was gone. Oh and by the way, once removed, the chemical smell is back. So make sure you wash your hands well after removing the stickers, and use a nice hand cream (or body butter) to cut off the chemical smell. I hope you enjoyed reading this review. 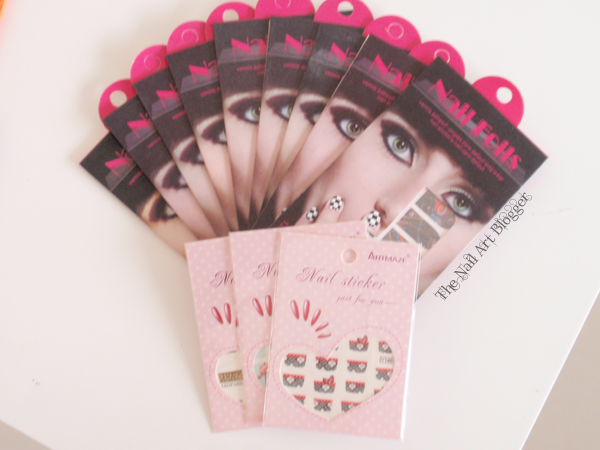 Have you used nail stickers before? What's your opinion about them? You can find those stickers at bornprettystore.com. The product number for the stickers is #5270. This particular sticker is pattern KE-12. At the moment it costs EU €1.45 (US $1.99) per sticker sheet. Born Pretty Store offers free shipping for all their items.